Thanks to my friend Rusty Fryman for bringing this article to my attention. Most people who have been in accidents understand the pre-trauma sensation of time slowing down. There were almost two minutes during which I knew we were heading for a collision. It felt like two hours. I remember the sound of the air-brakes failing, and the panicked cursing of our driver as we slowly realized how desperate the situation was. I tried as hard as I could to yell and wake everyone up to prepare for impact. I remember the sounds of confusion from behind me as our collective terror rose. I remember seeing the guardrail split, then a cluster of trees smacking against the front windshield. While we were airborne my eyes met with our driver’s. I knew then that we each shared the same look on our face; and I won’t soon forget it. We had spent enough time in the air to appreciate, make peace with and accept a fate we thought inevitable, and we looked at one another with a horribly silent “goodbye” in our eyes. When the bus hit the ground, I flew like a missile into the windshield. I can still see the double-paned auto glass turning blue and the spider-webbing cracks spreading outwards from the impact my body made. I hit the glass so hard, that the entire windshield flew from the frame to the ground, and I bounced back inside the bus. I landed on the ledge of the windshield. This came with an immediate and overwhelming pain throughout my body. I surveyed the damage to see instantly that my left leg was very obviously and badly broken. Then I lifted my arms forward to see if either had been damaged. My right arm was covered in burns, blood and broken glass, but working well enough. 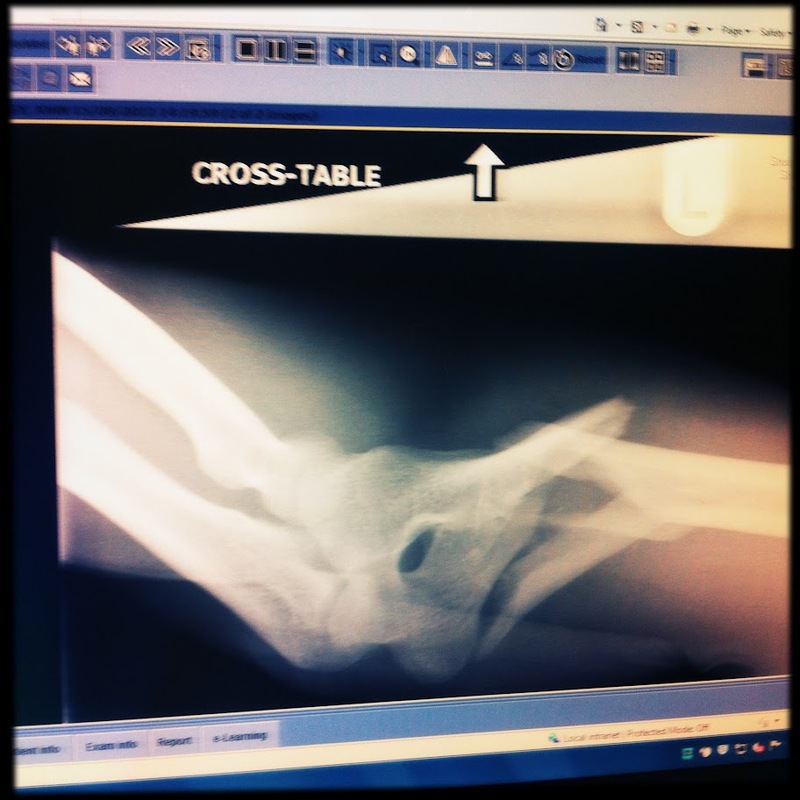 My left arm was crushed beyond belief, broken in the middle of the bone in my upper arm (humerus), and hanging 90 degrees backwar ds, with many spurs of bone poking through muscles and sinew at the surface of my skin. The bone was shattered into seven free-floating pieces, and my wrist and hand were swinging behind my back, spasming freely. Instinctively, I reached behind my back, grabbed my wrist and re-broke my arm forwards, hugging it to my chest, where it remained for the next three hours until it was cast in plaster. Meanwhile, I watched as some of the band was able to get off the bus and help the others, many of whom were broken-up as well, and several of whom were unconscious. There was blood, glass and diesel fuel everywhere. We were all rushed to the hospital in Bath, and treated for our various injuries, broken arms, legs, vertebrae, bruises, cuts, etc. Our driver was air lifted to a separate hospital with many breaks as well. A few of us had to remain in the hospital for a few days, I was hospitalized for two weeks, following an eight-hour surgery in which my arm was rebuilt with the aid of 2 massive titanium plates, 20 screws and a foot-and-a-half of wire. 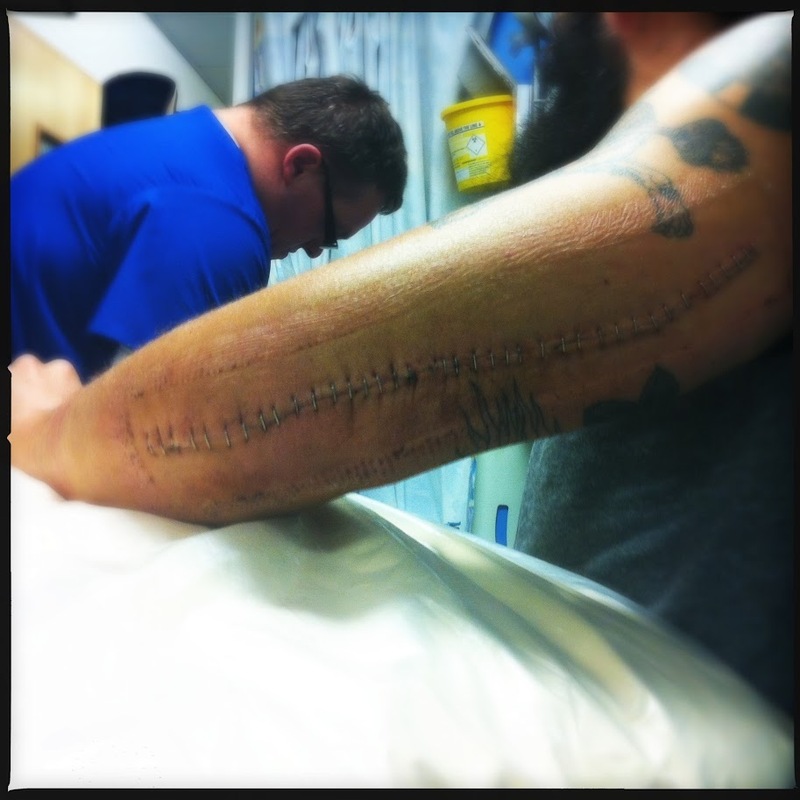 The 15″ incision took almost 50 staples to close up. I was left completely immobilized for the remainder of my hospital stay, able to do next-to-nothing on my own and in need of constant care. Following those excruciating first two weeks, I was quite literally stuck in an apartment for another three weeks with my family while waiting for my doctor to allow me to safely board an airplane, for fear of bloodclots and swelling. I have just this past week returned back to the US and my home, where I am wheelchair-bound for another several weeks of physical therapy, learning to use my arm and leg again. While I cannot lift a glass of water to my lips to drink with my left arm and hand, I am still able to play music with it. I picked up a guitar and played the day after I returned. Not without pain (for the time being), but the hand still acts out the creative impulses I give it. I’m told I was quite lucky to have regained any use at all of my hand and arm, though I have sustained quite extensive nerve damage. In spite of this and against my logic and reason, when I pick up an instrument, my hand remembers exactly what to do. It’s far from perfect, and will require a lot of therapy in order to recover mobility and strength, but I am encouraged by the ability I have been allowed. I do not believe in superstitious signs, but I am truly overwhelmed to have been granted the continued use of my hands. As a result of the crash, I feel encouraged not only to recover, but to move forward with Baroness, as we had been doing every day previous to August 15th. This accident has inflicted an injury which has left its mark on the band: physically, mentally and spiritually. In order to rehabilitate ourselves fully, we must work towards and then past the goals we had prior to the accident. I will consider our immediate recovery a success only on the day we plug back in to play another show. We cannot allow this accident, which I believe is unrelated to the band or our music, to slow down or stifle what has become so much more than a passionate hobby for the four of us. Through Baroness, we have discovered a method by which we may harness our drive to create, and channel all the emotion, anxiety and pain in our lives into something constructive. Music is the universal means of communication we have chosen to express ourselves. Our message has never been one of the absolute positive or negative, neither black nor white. True life occurs within the shades of grey, and I see this experience form that perspective. It seems only fitting to me that we continue working towards creating and performing again as soon as possible, as this band and its music are the vehicle through which we grow as individuals, artists and brothers. The injury the band suffered is an injury to my family and loved ones. Rather than allow it to become a wedge that forces us apart, I would like to see this experience become part of the glue that strengthens us. We have only begun to accomplish what we set out to do through this band. There is so much more to say, and though we do need to heal up a bit; we will not allow any of those things to be left unsaid. I have no regrets about touring. I don’t blame music or the touring lifestyle for my current physical state, or for the accident itself. It happened the same way all things happen: randomly. If I was a carpenter, and I was injured on the way to the job-site, I wouldn’t consider quitting my job. That is truly how I see this situation. Baroness doesn’t stop because we got hurt on the way to work. We love what we do much more than that, and we have chosen this path because it offers us an unpredictable adventure. With any adventure that involves travel, and with any real passionate pursuit, one will occasionally come face-to-face with the reality of living on the other side of the yellow line. I didn’t choose to be a musician in order to live a risk-free life, safely avoiding bumps and bruises. I didn’t choose to play music because it seemed like a simple opportunity to make some quick cash. Nor did I ever make the assumption that things would get easier as we progressed. We can do nothing but attempt to make something constructive and beautiful out of all this disaster, and we are well on the way to becoming active again. I have used this time, stuck inside my own head, to consider the importance of music and Baroness in my life. I can say, after nearly 6 weeks of reflection, that I feel more resolute and passionate about our music than ever. I have come to realize the importance of time in this particular equation, that is, I have none to waste and none to spare. There is no better moment than now, broken and in physical stasis, to devote ourselves more fully towards our art than ever. We cannot allow the traumatic fallout of our crash to cripple us internally. It seems simple: the shows we have cancelled we will reschedule and play in the future. It isn’t going to happen next week nor will it be next month. But it will happen. We will be back on tour as soon as we possibly can. There was one moment in the crash that cut me deeply. For one heartbeat and one tiny sliver of time, I became disconnected entirely. It was, specifically, the moment I impacted with the glass. In that barest heartbeat of a moment, I came face to face with the infinite. I didn’t see a light, or the tunnel or hear any music. Nor did I get a “best-of” montage of my life. Instead, I felt the tip of my nose brush up against the very same fate I had accepted moments before. I looked into a cold, unreflective mirror. It was the dark, silent, dispassionate logic of the end. I realized in that moment that life can be seen as a light switch: “on” or “off”. When the moment passed and I heard the screaming, felt the pain, and tasted my own blood, I was overcome with joy. I was ecstatic to be back amidst all that chaos and horror because it was alive and real. I finally glimpsed the relative importance of all things. The support of our fans, our friends and our families has real meaning to me now. I say that now honestly, without false humility. Thank you. Everyone. This entry was posted in Classic Metal, Classic Rock, Glam, Heavy metal, Internet Radio, Metal, Music, Rock, Rock N' Roll, RockStar, Tattoos and tagged Baroness, Bleach Bang, Bleach Bangs, Bleach Bangs Radio, Charlie Owens, Classic Rock, Cliff Burton, Glam, Glam Rock, Hard Rock, Heavy Metal, Metal, Music, Rock N' Roll, Rock Star, RockStar, the Hellion. Bookmark the permalink. ← KISS – MONSTER HAS ARRIVED!